You can lead a cat to water but you can’t make it drink! This is the problem faced by cat owners all over the country. Cats have a tendency to become dehydrated but getting your kitty to take on fluids can be challenging. A water fountain may be the answer to your problems. It provides fresh, oxygenated water that is constantly filtered to remove tastes and odors that could put your cat off. Your cat will think they are lapping from a mountain stream and will be taking on all the water they need to stay healthy. Several cats will be happy to use one fountain which is more than can be said for water bowls! To help you choose which one to get, here’s our guide to choosing the best cat water fountain. 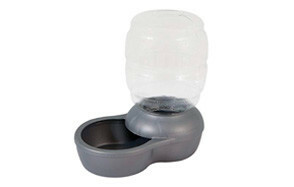 A stable and compact cat water fountain that has a water reservoir at the base. The recirculating water is pumped through a filter which removes stray hairs and sediment so the water is always fresh. The filter also removes magnesium and calcium from the tap water which reduces the risk of lower urinary tract diseases in cats. Chlorine odors and bacteria are also removed. There are three flow settings to choose from which are: gentle water flow; bubbling top and calm streams so even the fussiest cat will be happy! The reservoir will hold three liters when full and is opaque so it keeps the water fresher for a longer period of time. The cat water fountain is designed to take up little floor space but is very stable and at a comfortable height for cats and kittens. It’s free from BPA materials and is very easy to clean out. The filter needs to be changed every month. This cat fountain will constantly recirculate 50 ounces of water and deliver into the bowl as a fresh, constant stream. You can alter the speed of the flow. There is a ramp where the water enters the bowl to cut down on splashing. The water is pumped through a carbon filter to remove tastes and odors that could deter your cat from drinking. It is operated through a low voltage system to maintain safety. When the pump is removed, you can put the rest of the fountain on the top shelf of the dishwasher. The fountain is manufactured with BPA-free materials. A cat fountain that will suit cats of all sizes, it has a 200-ounce reservoir and the drinking height can be adjusted to suit your cat. The pump is isolated so it is very quiet when it runs and will not put your cat off. There is also a small ramp under the water stream to prevent splashing. The low voltage power ensures safety and adds very little to your electricity bill. Water is circulated through a polymer and activated carbon filter which removes tastes and odors and keeps the water fresh. The filter cartridge needs replacing at least monthly. The product includes a 10-foot power cord so you can be very flexible where you place it. The bowl is dishwasher safe and easy to clean. 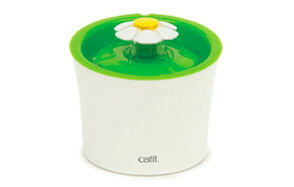 A pretty pet water fountain made without BPA materials but which contains PP resin which is antibacterial. It has a 56-ounce capacity reservoir and recirculates the water constantly. The pump is noise canceling so it won’t put your cat off and runs on very little electricity. The water is cleaned by a charcoal and foam filter that needs to be changed every one or two weeks. The more cats you have drinking from the fountain, the more often the filter will need to be changed. It’s easy to assemble and take apart again for cleaning. This cat drinking fountain will hold 128 ounces of water and delivers it in a constant stream into a circular bowl. It is made from BPA-free plastic for your pet’s safety and is easy to take apart for cleaning. It is dishwasher safe (top shelf only). It is suitable for households with several cats as there are five water streams but if you only have one cat you can choose one water stream. You can adjust the rate of flow and it also has a 360-degree design so your pets can all fit around it at once. The water is circulated through a carbon filter to take out bad tastes and odors so the water stays very fresh. The pump is quiet so it is not off-putting for pets. A gravity flow cat water dispenser that can hold from half a gallon up to four gallons of fresh water and dispenses it as your pet needs it. This saves you from having to continually top up the water bowl and is useful if you are out all day. As your pet drinks the water, it automatically refills but the water flows through a charcoal filter to make sure that the water is pure and fresh. It’s made from Microban anti-microbial plastic which cuts down on bacterial growth that could stain the bowl and taint the water. It is available in several colors. When the water runs out, you simply unscrew the bottle from the base and refill it. A pet fountain that will hold a gallon of water and deliver it as a constant stream for your pet. It has an extra-wide delivery spout that cascades the water over a stainless-steel ramp so the water gets oxygenated and tastes fresh. The drinking bowl is made from hygienic stainless steel that is easy to clean and provides your kitty with plenty of room to drink. You can clean the bowl on the top shelf of a dishwasher. There is an activated carbon filter to remove debris, odors and tastes and encourages drinking. The motor of this pet drinking fountain has a quiet operation so as not to scare off timid pets. Here we have a gravity water feeder that consists of a water reservoir and a stainless-steel bowl. Water is automatically released from the reservoir into the bowl as needed ensuring a constant supply of fresh water. The reservoir is available as 64-ounce, 128-ounce and 320-ounce capacities. By locking securely into the bowl, the reservoir does not tip over and prevents spills. It is made out of a plastic material that is both durable and safe because it is BPA-free. The hygienic stainless-steel bowl is easy to clean and dishwasher safe. There is a water flow-control valve which keeps the water in place when the water station is being carried. The unit can be fitted with a water filter that will remove odors and chlorine as well as sediment but this is optional and is sold separately. There are three available sizes for this pet water bowl which are 50 ounces, 108 ounces and 216 ounces. As your cat drinks the water and the water level drops, the reservoir fills the bowl back up so there is a constant supply of fresh water. The water flows into the bowl due to an electrically powered submersible pump to give oxygenated, fresh water. It passes through a charcoal filter to remove odors and debris. The bowl has a water-slide down which the water flows gently to prevent splashing. It is available in two colors to suit your home décor. Holding 70 ounces of water and providing a constant stream of fresh water, this ceramic cat fountain will encourage your kitty to drink. The bowl is made from a ceramic material that is non-porous and can be cleaned by popping it in the dishwasher. The fountain has a coconut shell filter that absorbs the elements that cause bad tastes and odors to keep the water tasting fresh. There is also a foam filter which removes hair and debris. The design offers a high and low drinking area which suits cats of all sizes and ages. It’s available in four colors. Water fountains are a fairly modern device and new developments are being introduced all the time. Here are some of the things that you may want to look out for in the best cat water fountain. The size of the reservoir dictates how much water the fountain can hold. If you have more than one cat in your home, you will need a bigger reservoir. Also, a fountain with a bigger reservoir needs to be refilled less often but you can’t leave it for very long periods of time in case bacteria build up. In water fountains that have a pump, electricity is used to circulate the water. They are more expensive and have running costs (and make a little noise) but the water is fresher. In gravity fed pumps, the water just flows into the bowl as it is used up. They tend to be cheaper and have no running costs but the water is not as oxygenated and therefore not as fresh. Some cats like a very fast flow of water, like a mountain stream, whereas others prefer something that is more gentle. A pump that has different speed settings lets you give your kitty what they want! If the drinking bowl is made of plastic, it should be BPA and toxin free. Some cats prefer stainless steel or a ceramic cat water fountain as they are less likely to transfer odors and tastes to the water. The fountain will need to be cleaned to get rid of stale saliva and to prevent bacterial build-up. Therefore, look for a model that is easy to disassemble and to clean. If parts can go in the dishwasher it is even more convenient. Cats are likely to be put off by a noisy pump! It’s best to choose a quiet device. Sometimes, the pump gets noisy when the reservoir needs to be filled. Fountains that splash can damage delicate floor surfaces and cause a slip hazard. Many of them have little ramps that break the fall of the water and prevent splashing. This is a useful feature to have. Filters play a big role in making the water palatable. An activated carbon filter will remove odors and tastes and a foam filter will remove hairs and debris. Some fountains have both. They do need to be replaced regularly and this is an on-going cost. A cat’s body is made up of at least 60% water. Cats need to take on fluids to keep them healthy, yet many cats are chronically dehydrated. Young kittens, senior cats and those with medical conditions are at an increased risk of dehydration. Cats evolved from desert animals who would have obtained most of their water from eating small rodents which contain a lot of moisture. Therefore, they are not naturally big drinkers! The problem is that these days, many cats are on a dry food diet which only provides around 40 ml of the 200 ml of water that cats need each day. Therefore, they need to drink at least 160 ml of water and most cats don’t manage that. Cat water fountains encourage your cat to drink and keeps them hydrated and healthy. They attract cats because they have running water and cats are fascinated by this. In the wild, cats drink from streams and they associate running water with safe water. They associate still water (as in a bowl) as stagnant water which is unsafe. The water in a fountain is circulated through filters so off-putting tastes and odors are eliminated. It is also oxygenated as it cascades into the bowl and this makes it taste fresher. Because it is stored in an opaque reservoir, it also remains cool. Several cats can use one water fountain but would require a water bowl each. Cat water fountains need some maintenance to make sure that they are working correctly. Here’s what you should do to maintain your water fountain. Cats will not like to drink from a dirty water fountain. Even the models that have filtration will get dirty. They need to be cleaned in the same way as a normal drinking bowl to remove saliva, debris and hairs etc. and to stop the multiplication of bacteria. You do this by disassembling the fountain and removing the pump and the reservoir. Then you can clean the bowl with warm water and a mild detergent but make sure that you rinse it thoroughly so no smell or taste remains. Many water fountain drinking bowls can be washed on the top shelf of the dishwasher but always check the manufacturers’ instructions. Many water fountains have filters. There may be an activated charcoal filter to remove tastes/odors and a foam filter to remove hair/debris. They may be combined into one filter. The filter needs to be changed regularly to make sure that it carries on doing its job. Many filters need to be changed once a month. Some devices are powered by electricity, they are low voltage and very safe. However, there is still a possibility that they will present a hazard if they are damaged and that is always a possibility when there are pets in the house. Once a week, have a visual check of all the leads, wires, connections and so on to make sure that they are intact. The fountains that have pumps will need some further attention. The pump will need to be periodically cleaned. To do this, you will need to follow the manufacturers’ instructions. Usually, you have to take the pump cover off and then remove the teardrop-shaped stator to expose the pump. Wash the pump, impeller and stator with soap and warm water, rinse it well and then reassemble. It can be hard to encourage your kitty to drink. As well as investing in a water fountain, here are some other things that you can try. Place it where your cat will not be disturbed or startled. Cats will not drink from dirty bowls so clean them often. Some cats refuse to drink tap water; it has to be distilled water or even mineral water! Plastic bowls can be problematic if they give the water a taste or smell. Ceramic and stainless-steel bowls don’t do this. The bowl must be wide enough to fit your cat’s whole face and whiskers in. Cats will happily share fountains but not bowls. This is not suitable for fountains but may work in bowls. Chicken broth and tuna juice are possible options but need to be changed regularly. Cold water is always more enticing for fussy cats. Q: How do cat water fountains work? A: Water fountains work by providing a constant supply of fresh water. You fill up a water reservoir, and the water is constantly circulated by an electric pump. As the water cascades into the drinking bowl it is aerated so it tastes fresh. Many water fountains have filters that clean and purify the water every time it passes through them. There is a simpler type of water fountain that does not have an electric pump. These are gravity fed from a reservoir of water. As the water level in the bowl drops, it automatically tops up. Some are fitted with optional filters. Q: Are water fountains safe for cats? A: Water fountains are very safe for cats to use. They are attracted to the running water and it encourages hydration. Cats can be seen dipping their paws into the fountain to check the temperature. They are powered by electricity but have a very low voltage so they present little danger to pets. The movable parts, such as the pump, are hidden away where pets cannot get at them. Q: Is it okay for cats to drink tap water? A: This very much depends on your tap water. One concern about tap water is the presence of harmful pathogens. If you live in a property that has an untreated water supply, this could be an issue. If the water is not safe for humans to drink, then cats should not drink it either. Normal water supplies are treated with chlorine to remove pathogens. Cats may not like the taste of tap water but there is little scientific evidence that it is harmful to them. Some areas have water supplies that have fluoride added to them. Some owners are concerned about the effect that this may have on their pets but it is added in such small quantities it is unlikely to be harmful. Q: Where Should the Fountain Be Placed in Your Home? A: Many water fountains are powered by electricity so they need to be somewhere near a socket. They do come with long leads but don’t let this cause a trip hazard in your home. Cats can be very fussy about drinking so the best cat fountain location will be somewhere quiet where your kitty will not be disturbed. It may take some trial and error to find the best location. 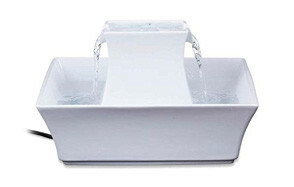 Our pick for best cat water fountain is a model that is stable and compact. The water is circulated by an electric pump and it passes through a filter to remove sediment, magnesium, calcium, odors and bacteria. You have three flow settings to choose from. The large reservoir will hold 3 liters of water when full and the bowl is at a comfortable height for cats and kittens. There are no BPA materials in this product and the bowl is easy to clean out.